including events where we will be exhibiting. In 2017 Geotechnical Observations’ Managing Director Andrew Ridley gave the John Mitchell Lecture at the Institution of Civil Engineers in London. Click on the image above to watch the lecture “Monitoring the Performance of Clay Slopes.” We are pleased to announce that Andrew will reprise and extend the lecture in a Keynote Address to the 7th International Symposium on Deformation Characteristics of Geomaterials, to be held in Glasgow on 26th - 28th June 2019. Our measurements at London’s Premier hotel Claridge’s have featured in an article in Ingenia. This project also won the prestigious BGA Fleming Award. Geotechnical Observations is looking to appoint someone to our Board of Directors who will be directly responsible for generating and delivering sales. This person will work alongside the other Directors including those responsible for Operations, Finance and Human Resources. It is likely, but not essential, that candidates will already be working on the Board of Directors within another company and are therefore familiar with the challenges and the rewards that a job of this kind brings. Geotechnical Observations is a well-managed, independent company with no debts and a strong balance sheet, which provides an ideal platform for growth. • You must have a thorough understanding of geotechnical instrumentation and the value that monitoring can bring to construction projects, together with detailed knowledge the costs involved with delivering industry leading monitoring solutions. • You must have a track record of building and maintaining an effective sales pipeline, writing winning bids and ‘nailing’ sales. In addition you will be able to demonstrate a passion for sales that aligns well with our mission and values. • You must be capable of working with the other Directors to help shape the strategy and direction of the company and have a passion to capitalise on new revenue opportunities. This role will be demanding and challenging, but for the successful candidate your personal success will translate directly into the success of the company. The post will be based at our office in Weybridge, Surrey, working predominantly in the region around London, with frequent travel to potential client sites across the UK. Note – Applicants must have full unrestricted rights to work in the UK. Thank you for your interest in this position. For your information this role is accompanied by a salary of £75,000, a pension contribution of 4% of the basic salary and a performance related bonus of up to 50% of the basic salary. If you are still interested please send your written application including an up to date CV to hr@geo-observations.com. Note: You must have full unrestricted rights to work in the UK. Shortlisted candidates will be contacted in the first instance for an initial telephone interview to be followed by a two-stage formal interview process. Geotechnical Observations is delighted to be a Gold Sponsor for Ground Engineering’s Instrumentation & Monitoring Conference in March 2019. We are particularly excited to announce that our Director Jonathan Gammon will be delivering a Keynote Address on Trends and developments in instrumentation, monitoring and data in geotechnics. Read an interview with Jonathan here. In addition Gary Evans will present a talk on Lessons learnt from instrumentation and monitoring on the Northern Line Extension and Andrew Ridley will give an update on ISO 18674 Geotechnical Monitoring using Field Instrumentation. Put this together with a presentation on the instrumentation used to monitor Claridge’s Hotel during the construction of a five storey basement below the working hotel given by Dinesh Patel of Arup and the evening roundtable discussion that is also sponsored by GeO, makes this a must be at event if you want to find out more about what we do. Click on the image above to visit the registration page. Geotechnical Observations is pleased to sponsor Ground Engineering’s 50th Anniversary Supplement. 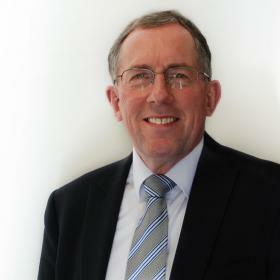 to read what our Managing Director Andrew Ridley has to say about instrumentation and monitoring. Geotechnical Observations is pleased to be sponsoring the drinks after the joint BGA / BTS meeting at the ICE on 22nd October. We are very pleased to announce that GeO's Northern Line Extension team has been shortlisted for an NCE Tunnelling Award in the Community Engagement category. This is for the work done in the Kennington area of south London, where they installed, read and decommissioned over 300 survey points to protect 73 properties. Access was negotiated with 123 different people and required dedication and professionalism. Well done team!! 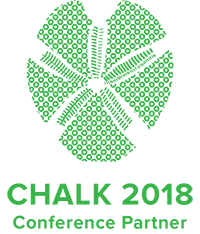 We are pleased to announce that we will be sponsoring the Chalk 2018 conference. The conference is being organised by the British Geotechnical Association (BGA) and will be held at Imperial College London (IC) on 17th and 18th of September 2018. Geotechnical Observations has a very long relationship with BGA and IC, so we are proud to be associated with this prestigious event. We are sponsoring students at the event and will be putting up our exhibition stand. Our Head of Geomatics, Bruno Norberto, will be giving a presentation at GEO Business on 23rd May, about the networked system of total stations that we installed for the Northern Line Extension Project in London. 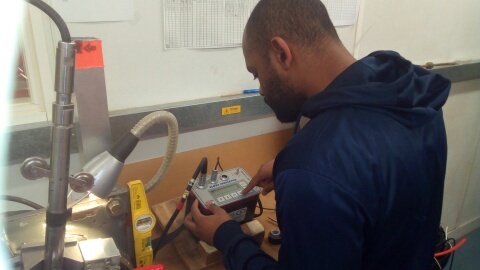 Mohamed (Instrumentation Engineer at GeO) being trained in how to calibrate an inclinometer probe using our UKAS certified rotary table. All of our inclinometer probes are examined and cleaned after every site visit. They are put through a static tube test every week, to track the check-sums under repeatable conditions. This identifies any changes, such as worn bearings, at an early stage. They are checked using our rotary table every three months and a new calibration certificate is issued if any adjustments are done. A full calibration is carried out every 12 months. We believe this process helps us deliver high quality inclinometer measurements in piles, retaining walls and slopes. Contact us if you want to hear more about how we do this. SAAV is the newest and most advanced ShapeArray model. Inspired by direct feedback from customers, SAAV uses a new, unique, off-the-reel cyclical installation system, which inserts the ShapeArray in a zigzag pattern into casings from 47 mm to 100 mm in diameter. The SAAV is then locked into place with a Spring Box assembly. SAAV is ideal for using in existing conventional inclinometer casings or for new installations into smooth casings such as reservation tubes in piles and diaphragm walls. SAAV is available with 500 mm long segments and in total lengths of up to 150 metres. ICE members can view a recording of the lecture at https://www.ice.org.uk/eventarchive/john-mitchell-lecture-2017.